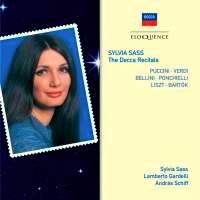 As part of the Decca Eloquence series of recent vocal releases comes the latest addition which includes the complete Decca recitals of soprano Sylvia Sass from the late 1970s. 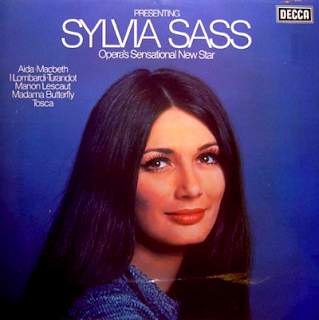 Previously only available on CD from Japan (Decca did release "Presenting Sylvia Sass Opera's Sensational New Star" as part of its Classic Recital line in 2005) these recordings are welcome treasures to any collection. Note: The series also features a first-time CD release of Tchaikovsky songs with soprano Galina Vishnevskaya, details can be found here and don't forget to check out the other three discs coming out featuring Peter Pears, Kiri Te Kanawa and Kenneth McKellar by clicking here. 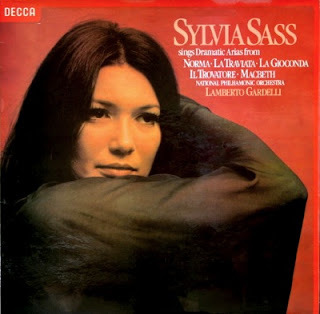 Purchase the Sylvia Sass disc by clicking here. More information and complete track list after the jump. Sylvia Sass was born near Budapest, Hungary, in 1951 to a very musical family. Her mother was a coloratura soprano and her father a high school music teacher. She made her stage debut at age 14 in Adam's operetta Die Nurnberger Puppe and then commenced study at the celebrated Franz Liszt Academy in Budapest, completing a five-year program in two. Her professional debut was as Frasquita in Carmen in 1971. Several awards followed - 1st prize at the Kodaly Voice Competition in Budapest, 1972; winner at the International Opera Competition for Young Singers, of the Grand Prix as Violetta in La traviata, 1973, the Silver Medal at the International Tchaikovsky Competition in Moscow, 1974. She was also made an Honoured Artist of Hungary in 1977. While still in Budapest, she performed such dramatic roles as Freia in Das Rheingold, Violetta in La traviata and Mimi in La boheme. International stardom came with a composer with whom she is most associated and in a role represented on her Decca recitals - Giselda in Verdi's I Lombardi at Covent Garden in London, 1976. The next year she made both, her Italian debut in Turin as Lady Macbeth, and her Metropolitan Opera debut as Tosca alongside Jose Carreras. La Scala followed the year after, in 1978, where she sang Puccini's tragic heroine Manon Lescaut alongside Placido Domingo. Soon, Sass was being heralded as 'the new Callas', and she did meet Callas in person, thanks to a meeting set up by Leonard Bernstein. True, the voice had a similar dramatic colour, but Sass quickly rebuffed the comparison, saying, 'Callas was so great and so unique. I just don't think it's fair to compare somebody with such a great artist.' Her three recital records for Decca include two discs of operatic arias, including all her most celebrated roles, both conducted by Lamberto Gardelli, and a disc of songs by Liszt and Bartok with her compatriot, pianist Andras Schiff. All of these are issued collectively as a 2CD set for the first time. In recent years, Sass has settled in France, where she keeps busy painting and giving masterclasses. "you could say that Sylvia Sass had taken the best from Callas's and Sutherland's Norma ... 'Sempre libera', which sounds appropriately hectic, is fearlessly done (with a tender, ardent incursion from Ian Caley as Alfredo) ... her vibrant 'Suicidio' is undeniably exciting ... The Decca recording is faultless." - Gramophone. "The very first phrases of the opening aria (Turandot's 'In questa reggia', no less) command attention and let you know that something rather special has arrived on the scene. And as the Puccini arias follow one another it becomes quite clear that here is an exceptional singer, distinctive in timbre, distinguished in artistry. The voice glitters rather than soothes, shines rather than warms. It is powerful, has a wide range, and is firmly placed. The tone can be brilliantly luminous (as in the Turandot aria), or may acquire a deeper kind of radiance (as in the 'Vissi d'arte' that follows it)." - Gramophone. 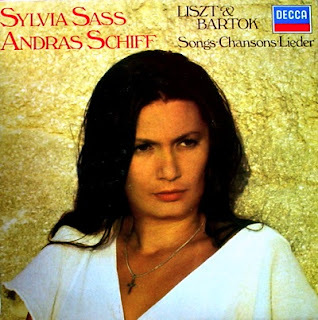 "Entering into every nuance of the songs' moods, and employing a dynamic range from the merest whisper to a full-blooded climax, Sylvia Sass makes the utmost of their not very rewarding vocal line; but the success of this performance is assured by the subtle playing of Andras Schiff, who conjures up beautiful sounds from the swirling figurations [Bartok] ... 'Die Loreley' is an evocative scena, sung imaginatively (and with much flexibility of pace) by Sass, bringing into play a vocal quality as seductive as that of the siren herself; and her gentle singing of the serenade 'Kling leise, mein Lied' would melt the most obdurate heart. ... all the performances here are unusually illuminating and satisfying; and the recording is excellent." - (Liszt, Bartok) Gramophone. A Decca Eloquence CD set. Artists:	Sylvia Sass (soprano), Andras Schiff (piano), Ambroisian Singers. Composers:	Bartok, Bellini, Liszt, Ponchielli, Puccini, Verdi. Orchestras:	London Symphony Orchestra, National Philharmonic Orchestra.